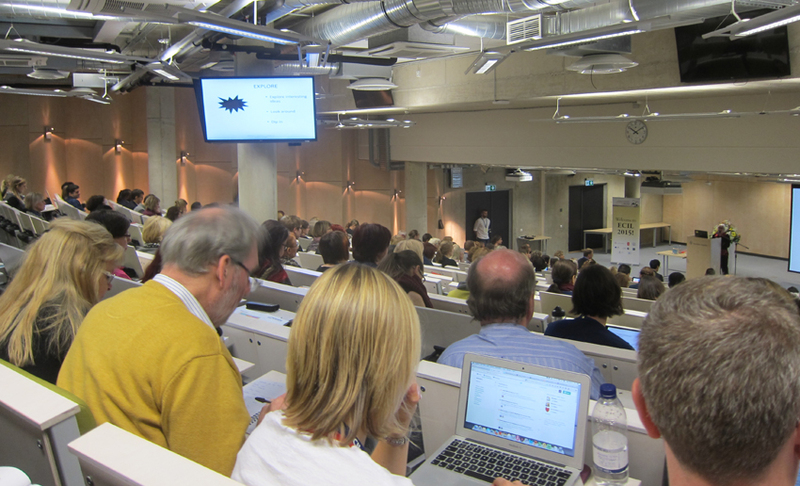 It's day three of the European Conference on Information Literacy 2015 and I have to confess that I arrived a little late, and therefore this liveblog has the caveat and apology that I missed the very start of the keynote by Carol Kuhlthau: Guided Inquiry: A Pathway to Information Literacy in Action. The photo shows my view from the back (rather than my usual front row view). Kuhlthau proposed a definition for Information Literacy which was: "Information Literacy is the ability to use information to construct knowledge for wise action". The question was how to develop this kind of IL in learners: Kuhlthau was proposing that using her Information Search Process model and Guided Inquiry in combination would be valuable. Kuhlthau mentioned some recent responses by other organisations to the question of "what is information literacy?" e.g. the new ACRL framework and the Standards for the 21st Century learner. 1) "How do I find information about my questions?". This had an associated concept that "Information that is organised provides access to facts, ideas and multiple perspectives". She mentioned David Ellis' steps in information seeking. 2) "How do I know know the information I find is dependable?" with an associated concept "Valuable information prompts curiosity, reflection and enlightment"
Kuhlthau identified a gap in understanding how information becomes knowledge, and she highlighted some work which relates information behaviour to learning (e.g. Heinstrom, Limberg - and I would add my colleague Nigel Ford). (This is reaching back to the concepts of surface/strategic/deep learning developed by Ference Marton and his colleagues). There was also Kuhlthau's own work, including her work of many years into seeking meaning and her Information Search Process model. She has a lot of information about this research model here https://comminfo.rutgers.edu/~kuhlthau/information_search_process.htm Kuhlthau talked through some key elements in the model e.g. the critical stages of exploration and formulation, and she focused on uncertainty as part of learning (uncertainty being one of the stages in the affective aspect of the ISP). She also explained her ideas of zones of intervention (the points where the librarian could best help the learner, within the ISP). Finally Kuhlthau brought together the Guided Inquiry process and the Information Search Process. Again there is a good amount of information about this on her website here https://comminfo.rutgers.edu/~kuhlthau/guided_inquiry_design.htm so I won't try to explain it here. She finished by adding to her definition a further gloss "The ability to interpret and use information for creating solutions for sustainable living".